Crossfire II 2-7x32 Scout Scope is rated 4.6 out of 5 by 40. Versatile, practical, utilitarian, and just plain cool—Scout rifles hold a special place in many hunters and shooters hearts. So we created a scope specifically designed to optimize the performance characteristics of the platform. With an incredibly generous 9.45” eye relief to accommodate forward mounting, and a 2-7 zoom range, the Vortex Scout Scope is the perfect optic for any job you and your scout rifle want to throw at it. 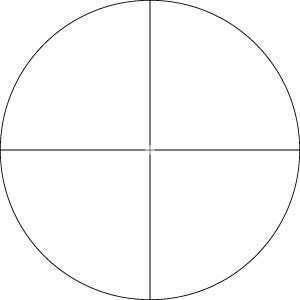 This is the single best, and most popular, all-purpose hunting reticle. Intended for a wide variety of hunting applications. 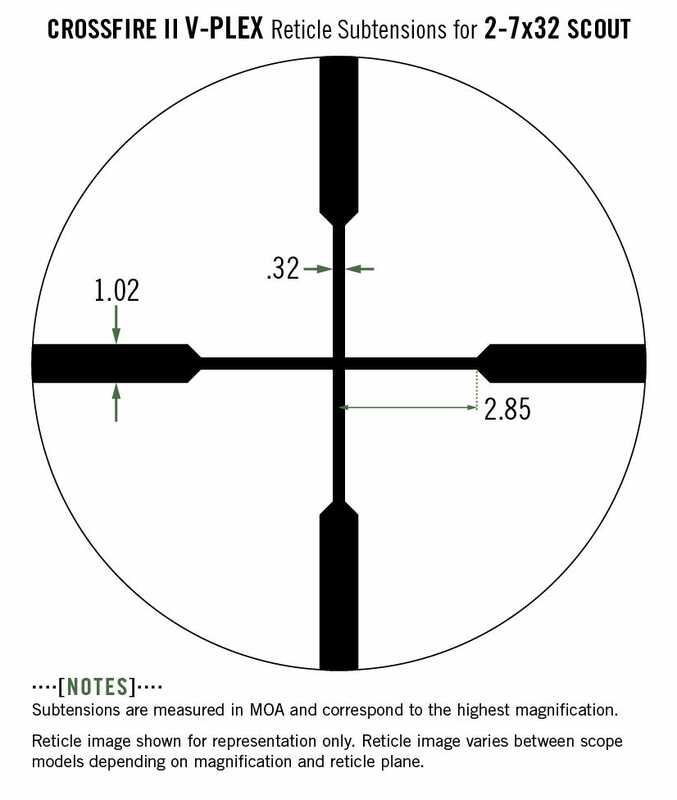 Subtension detail for Crossfire II 2-7x32 Scout riflescope with V-Plex MOA reticle. Rated 4 out of 5 by J-rey from Better Than My Previous Scout Scope I purchased this scope to replace my Leatherwood scout scope. This is by far better but leaves some to be desired as when you change magnification your eye relief seems to change significantly. I think Vortex makes quality products and this initial venture into the scout scope arena will only be improved upon. This scope works well on my m1a scout but I won't be opposed to upgrading to a future Vortex scout scope perhaps with Diamondback glass, an mil reticle or something with a v-brite as well. My ideal scout scope would be a diamondback or viper class with mil reticle and a v-brite dot in 2-7x30.. That would be an amazing rig for scout scope enthusiasts. Rated 5 out of 5 by Dave the American from Excellent Product, Superb Results I have the Crossfire II 2-7x32 Scouts Scope on my Ruger Gunsite Scout for a while now. When I initially purchased the glass I was a little nervous as I hadn't heard much about Vortex. After a little research and the unbeatable warranty I pulled the trigger. I use scout rifles for everything from deer to pig and had always had trouble with reliable optics. The first thing I noticed when u boxing this scope was sleek precision with which it was made and it's ruggedness. After mounting it with Vortex's medium height rings I took it out back and began to zero it. The accuracy of the MOA adjustments made it a breeze to zero at 100yds. Fast forward 2 dozen hunts, a couple flights as checked luggage, and countless hours trampling through the woods and it's zero has remained unfazed. I am a Vortex man for life now and even sing their praises to those that'll listen. Their product quality, unmatched warranty, and reasonable prices make Vortex my new official company for optics. Rated 5 out of 5 by Scott Smith from Perfect! Forward mounted the Crossfire II 2-7x32mm Scout on my Ruger Mini-14. This is a perfect pairing for a "scout" rifle. With ~10" of eye relief, I can scan the target area with both eyes open for a "picture-in-picture" view, and with a twitch focus on the reticle and place the shot. 32mm objective and medium ring set keep the cheek position only slightly higher than the hard sight position. Mount location also keeps the scope clear of the ejection port. Thank you Vortex for making the perfect scope for this application! Rated 5 out of 5 by John from Perfect Mauser Scope Got this scope to put on my Czech VZ24 Mauser that I did not want to drill and tap as the receiver I had came with good original markings on it. Simple non-destructive aftermarket scope mount was put where the rear sight was (removed and can be replaced). This placement allowed for installation of this scope with perfect eye relief for the Mauser. The surprising thing which I figured would be too much to ask for was the use of stripper clips. Amazingly, I am able to use stripper clips with no clearance issues. For all intents and purposes, this scope only adds to the Mauser and takes away nothing; balance is maintained (not forward heavy). For the price, you could not find a better scope that is perfect for a stock Mauser. Rated 5 out of 5 by Zac from Fantastic scope for the money There aren't many variable power scout scopes still manufactured today. Decided to give this a go, and have been very impressed. Easy to zero, great optics quality even out to 500 metres for pig size targets. The scope holds zero perfectly, even after 100 rounds of .308. Quality definitely exceeds the price tag! The only negative points are the dimensions, where the occular bell housing is bigger than the objective bell housing. So you might need medium rings instead of low, and mount it slightly higher as a result. Rated 5 out of 5 by Shinndog from Vortex Scout 2-7x32 - ultimate Scout rifle scope Aloha! I researched for a scout rifle scope to place on my mini 30 for some time. The choices I had included Burris, Leupold and Vortex scopes. I chose the Vortex Scout because it had great reviews and the price point was excellent. Once mounted the scope has been a pleasure to use. The glass is clear and the eye relief spot on. I would purchase this product again. The warranty on all Vortex products is also excellent. I own vortex binoculars, red dots and the Scout. I will look into the HST and or Razor LH for a future build. Mahalo! Rated 4 out of 5 by Karter82 from UPDATE on "Arrived obviously defective" review Some months ago I posted a review here critical of the scope. In the time since, I discovered a serious rail defect on the Mossberg MVP Scout Rifle that may be an inherent design fault. The front four inches of the rail is distorted downward enough to leave the front about .035" lower than a point 4" back. Since this is exactly where a long eye relief scope needs to sit, the discrepancy is almost certainly what caused the scope to shoot way high and run out of vertical adjustment. I've attempted to add a photo showing the situation. You can clearly see the discrepancy at the front (LHS in picture) of the rail under the straight edge. The front rail screw goes through at point 2. The bottom of the rail leg at that point is flat in relation to the top ring mounting surface. The barrel has an obvious taper at that point. When the screw is tightened down, point 3 hits before either point 2 or point 1, torquing the front of the rail downward. I believe this is a basic rail design fault and have been in contact with Mossberg over it. Since the probability is very high that I returned a perfectly good scope I need to be fair to Vortex, admit my goof and retract my negative review. Since I was never really able to truly evaluate the scope because of the rail defect, my ratings should be disregarded. Rated 1 out of 5 by bellavite1 from Great disappointment I purchased this product in September 2016 to be used on a Springfield Armory M1a Socom 2. I ended up returning the scope to the dealer in November 2016. Never got around to write a review, but it looks like there has been no improvement in the product, so here it is. A few numbers: Rifle: SA M1A Socom II Rings : Weaver Tactical High Load: 40 gr of IMR 3031 Velocity: approx 2540 fps Bullet: 30 cal BT 150 gr (WIDENER) I have Vortex optics on all my rifles, be it scopes or red dots, and I cannot speak highly enough of them. I work at a gun range and I recommend them to my customers, so I had great expectations for this... HOWEVER... I shot the rifle both at 25 yds and 100 yds, it consistently grouped abou 6 MOA high. Elevation on the scope was bottomed out, I called Vortex and they were no help, even though it seems to be a recurring issue with this scope. All Vortex could say is that I need a scope with more travel..DUH! Very disappointed in the product and customer service.